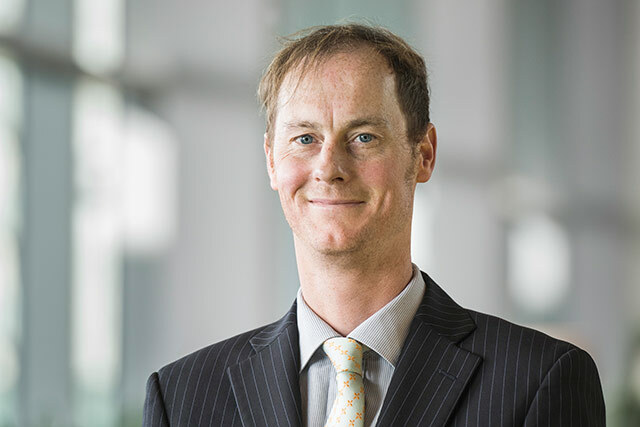 Jon Copestake Chief Retail and Consumer Goods Analyst at the Economist Intelligence Unit debates what makes a city liveable. What is liveability? “Liveability has come to mean a lot things to a lot of people over the years, when I started using the term 15 years ago it really wasn’t in common usage, liveability as a topic has become a living breathing discussion term in its own right,” Copestake explains. According to Copestake, the big challenge is that the liveability survey is global examining 140 cities worldwide. The five categories used to evaluate a city are: stability, healthcare, culture and environment, education and infrastructure. Scores are given where one is ideal and five is intolerable. These are weighted to generate a score where 100 is ideal. “What does the score mean? One of the problems with producing a ranking is that people tend to focus on the position of a city rather than the score it has achieved. It is the tier a city receives that matters,” says Copestake. “What’s the point? How does this relate to the world? Liveability began life as a means of measuring hardship for expatriate allowances. It still fulfils that role with different liveability scores reflecting different levels of hardship remuneration. However, now it is widely used as a benchmarking tool for cities to compare themselves to one another. Liveability has widely become a term that defines city development strategies to attract talent and investment. Copestake was taken by surprise by the amount of public interest in the survey and views the feedback as valuable as it allows citizens to express pride or air grievances. “The debate around liveability is an ongoing dialogue.” Copestake evaluates what is missing from the survey and explains that there is always room for improvement. The survey doesn’t account for cost of living and affordability. This is a deliberate omission as it is viewed as being a separate topic. Another factor is that data gathered from some cities is poor. Bringing together enough data at city level is a challenge. The third factor is that environmental or green space is not included. He does draw attention to other projects in this area. 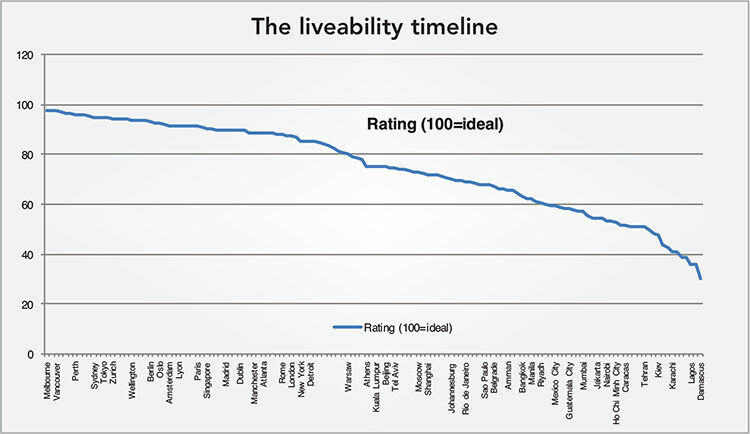 Of the 140 cities surveyed 65 are in the top tier of liveability. Fewer and fewer cities in the worst category as data can only be collected where it is safe to do so and many cities that are war torn are omitted. 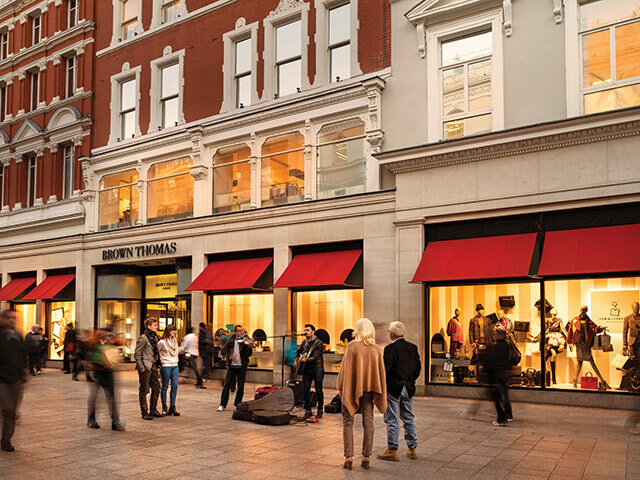 Dublin is ranked 42nd in the list of cities and is the only Irish city surveyed. 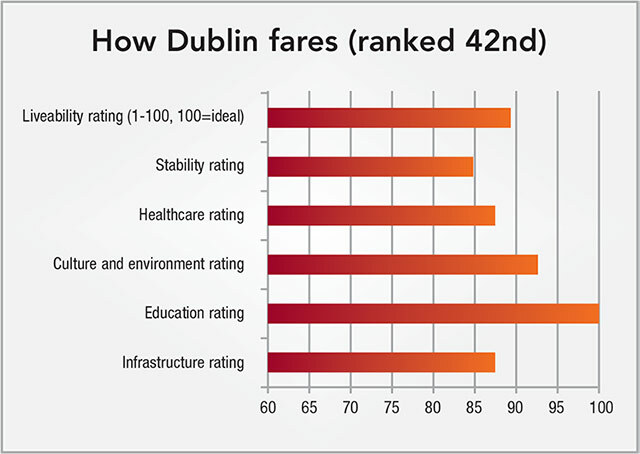 The survey has a global emphasis and Dublin’s score tends to reflect that of many relatively large developed city economies. It scores well for education, healthcare and culture. However, the popularity it enjoys weighs on infrastructure and stability slightly. “Like many cities of this size it does suffer from a bit of its own success, such as infrastructural planning. Congestion is a problem and it has a higher crime rate than cities like Melbourne. These are factors that can affect people but doesn’t affect day-to-day life. I think this is a conundrum for people working in town planning: Do they want a city to be more liveable or do they want a city to be economically successful? Because a city that is economically successful doesn’t always have all of the things that make it liveable. Copestake points out an ugly truth that the most liveable safest cities can also be a bit dull and boring. On the other hand, cities that are vibrant may not be the best place to raise a family. “When you are planning a city you want to do so without making it bland – you want to keep its individuality and what makes it interesting, in a way finding a hybrid between liveability and interesting.